Denali, also formerly known as Mount McKinley, is the highest mountain peak in both the United States and North America. It is exactly 20,310 feet (6,190.5 m) high. It is in the highest part of the Alaska Range. Denali means "the high one" in the Athabaskan language. Denali is in the middle of the Alaska Range. It is about 130 miles (209 km) north-northwest of Anchorage and 155 miles (249 km) southwest of Fairbanks. The summit is about 35 miles (56 km) from the nearest major road, the George Parks Highway. 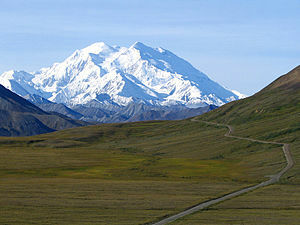 Wikimedia Commons has media related to Denali. This page was last changed on 26 December 2018, at 01:57.